The best teaching package to legal citation is now even better. This sleeker edition still presents a single and consistent system of citation for all forms of legal writing, but the new, clear, attractive, modern design makes it even easier to use. The teaching package also now includes a new website with more than 600 online exercises for student practice and mastery. Purchase includes access to comprehensive website with hundreds of exercises for student practice and mastery of the rules of legal citation. Comprehensive website with hundreds of exercises for student practice and mastery of the rules of legal citation. Allows professors to spend more class time focused on other aspects of legal writing. 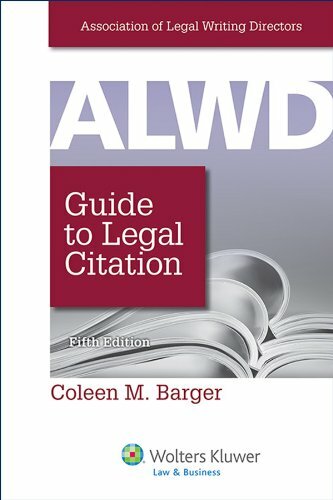 New editor, Coleen M. Barger, is well-respected in the LW community and has a deep knowledge and appreciation for the intricacies of teaching legal citation. Elimination of stylistic differences between the ALWD Manual and the Bluebook, to help combat the perception that students who learn citation with ALWD do not know how to Bluebook. Reduction of length by 100-150 pages. Return to a focus on content that is relevant to 1L students. More esoteric content moved out of print manual to a website. Content that needs frequent updating moved online. New, more modern page design improves ease of use. If you have any questions about this product by Wolters Kluwer Law & Business, contact us by completing and submitting the form below. If you are looking for a specif part number, please include it with your message.